Police and paramedics responded to reports of a sudden death at an address in Watkin Lane, Lostock Hall on Thursday, April 4. Pic - Aaron Dawber. ​Police and emergency services responded to a 999 call yesterday (Thursday, April 4) at 12.20pm after reports that a person had died suddenly in Lostock Hall. CSI and forensics attended the scene and investigated the "sudden death". The address was cordoned off by police between 12.30pm and 4.30pm. Police have confirmed that a 35-year-old man has died. He has not been identified at this stage. The circumstances of the man's death have not been confirmed, but the cause is not being treated as suspicious. Paramedics attended and discovered the man unresponsive. He was pronounced dead at the scene. 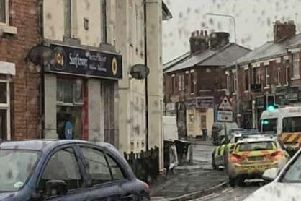 The man died in a flat on Watkins Road, next door to the Sunflower Chinese take-away and opposite the Pleasant Retreat pub in Lostock Hall. Yasin Onemli, who works at Lostock Hall Kebab House, said: "There's always something going on in those flats. I work at the kebab shop across the road and every day there are ambulances and police cars stopping there."